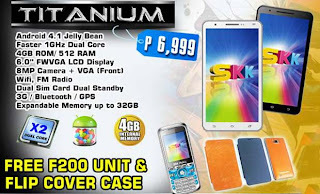 To those who are looking for a bigger screen Android smartphone go check SKK Mobile Titanium, it has a 6 inches screen display for the price of 6999 pesos. Titanium runs on a Jellybean OS along with faster 1GHz dual core processor. This handset is included on SKK Mobile Android Frenzy sale where you can get free F200 with every purchase of SKK Mobile Titanium. Not just that guys, you’ll have to get a free flip cover case for this unit if you happen to buy it on the promo period. The storage of this phone caters up to 32GB using microSD card, 4GB ROM where you can save your apps if in case you haven’t found any how to root tutorial over the net. If you want to gain that big microSD storage space for your files, photos and videos just buy one. RAM has 512MB which I think good enough to handlebasic multi tasking job on a dual core processor. The camera specs give you 8 megapixels on the rear side, this can be use for your basic photography needs and a VGA front facing for video calling apps like Skype, WeChat and more. For connectivity, SKK Mobile Titanium is Wi-Fi capable phone for you to connect free internet access on malls and shopping stores. The presence of 3G network connectivity gives you flexibility on connecting to the internet in case you are not able to connect a free Wi-Fi hotspot. 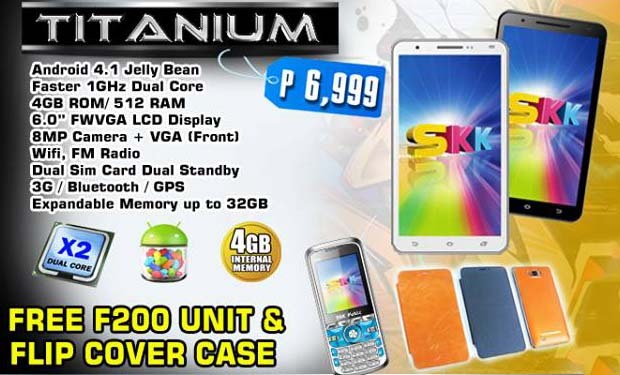 To those who are asking where to buy this phone, just visit at your nearest SKK Mobile stores, kiosk and dealers nationwide to inquire and avail. Do note that mentioned freebies are only available on their Android Frenzy promo.